April 2003: Image of the former location of the Pico Canyon boarding house, from the perspective seen in the 1905 photo of the "Walton Young homestead." 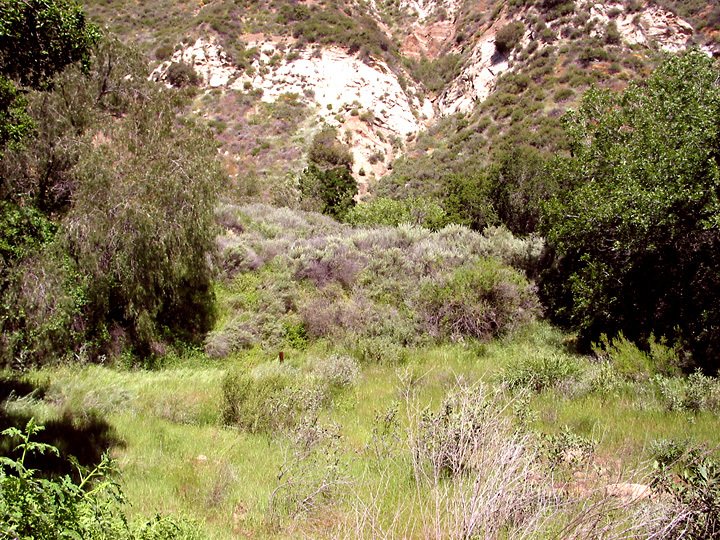 In Pico Canyon, about a half mile above Johnson Park, there is an oleander bush along the left side. Here is a pile of rotted timbers that once comprised a bridge across the creek to the Young home. Another 50 feet or so up the road the creek crosses under the road from the south side to the north side. Now as you look to the south, left, off of the road into a low area, you are looking at the flat parcel that is the site shown in the photo.